Last Tuesday, we posted a blog entitled “The Anatomy of the Perfect Job Tweet“, which outlined exactly how to go about constructing effective job tweets that suitable candidates won’t be able to resist clicking. And we’re delighted to be able to say that we’ve been getting some incredible feedback from you about the post, and that the framework has been working wonders for many of you. Yay! Once you have signed up for a free account on Buffer, the first thing you need to do to get started is to connect each of your social accounts. 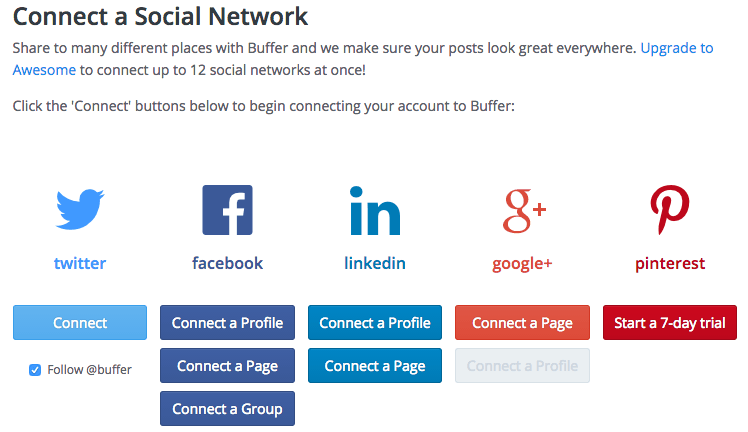 Using a free account, Buffer allows you to connect four separate social media accounts including Twitter, Facebook, LinkedIn and Google+. 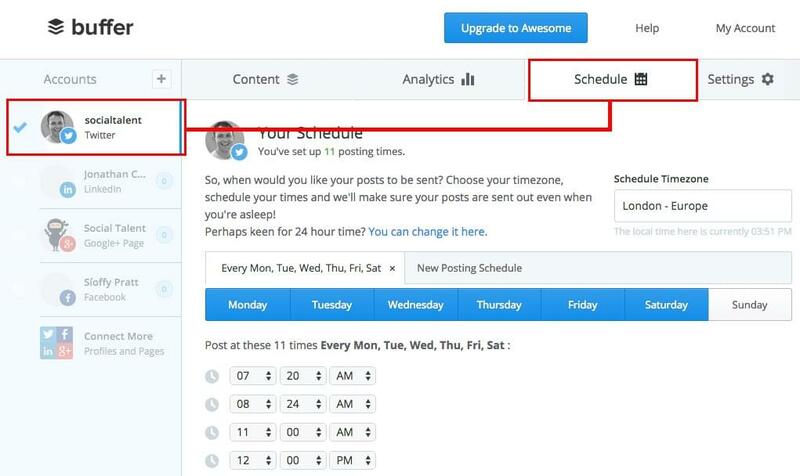 Once you’ve connected all your relevant accounts the next thing you need to do, for each account, is to tell Buffer the days you want your content to post and the times you would like it to post at. This is where posts like “The Best Times to Post on Social Media (Infographic)” and free tools like Tweriod come in handy. 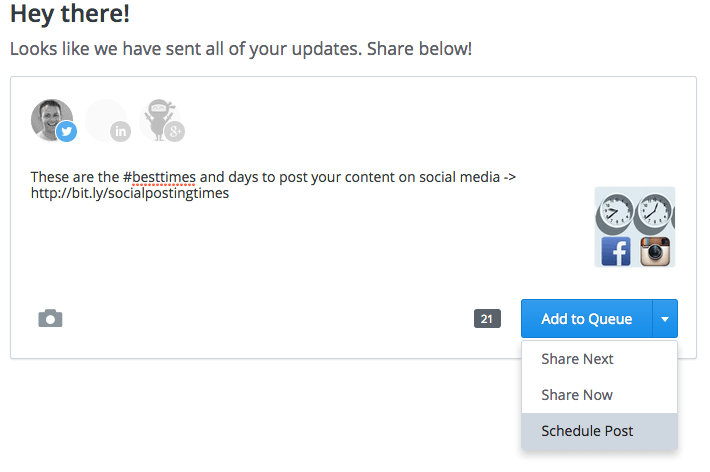 They can inform you as to when the best time to post your various social updates is according to your unique audience of followers, and you can use Buffer to ensure your content is posted at those times. This step is optional, but super handy if you use a URL shortener! And you should be using a URL shortener! Not only do they allow you to save some of your 140 characters for more important messaging if using using Twitter, by cleaning up the size of your link, but they also give you great metrics to accompany your links which lets you know things like the number of people who clicked on your links, when they clicked them, and which social networks each link has been shared to. 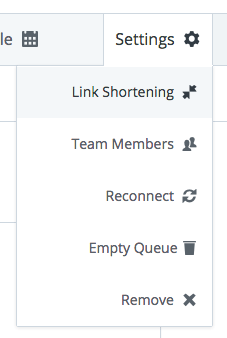 And Buffer gives you the option to link your chosen URL shortener with your Buffer account or opt to use one of it’s own. 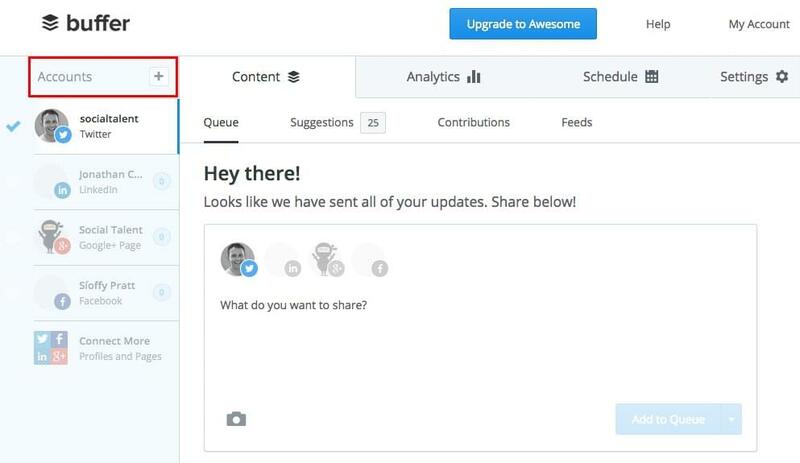 At Social Talent, we use bit.ly to shorten our URL links and track their progress, so we have linked our bit.ly account to our Buffer account. 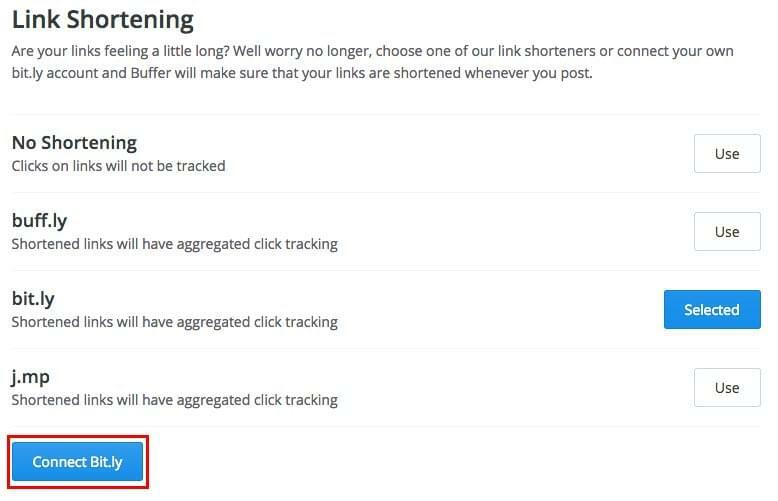 Once linked, every time you include a URL in your Buffer updates, bit.ly will automatically shorten it for you and track it’s clicks. More info on the benefits of URL shorteners can be found here. 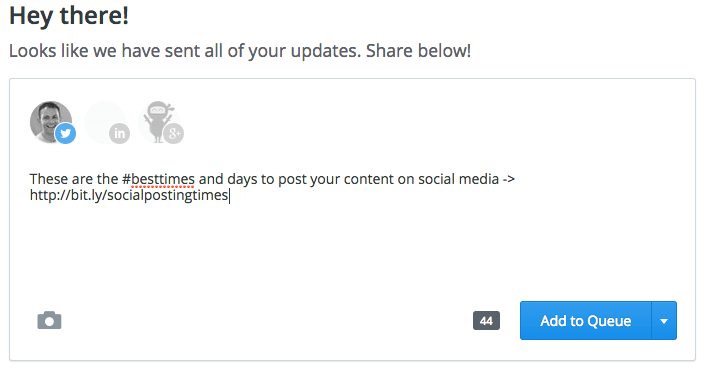 Now that you have selected the days and times you want your content to post, and linked your URL shortener to your Buffer, it’s time to start writing the updates you want to post via Buffer. 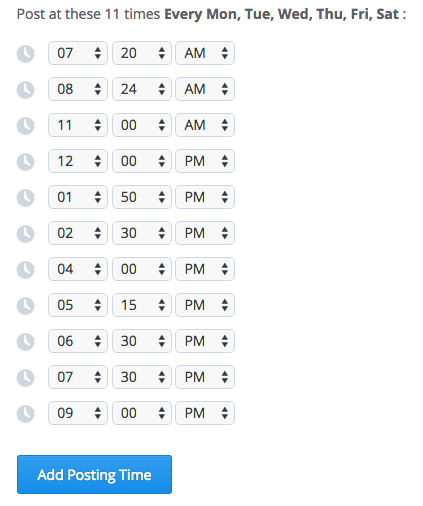 Remember those posting times you set up in Step 2? Well, this is where they come into play. 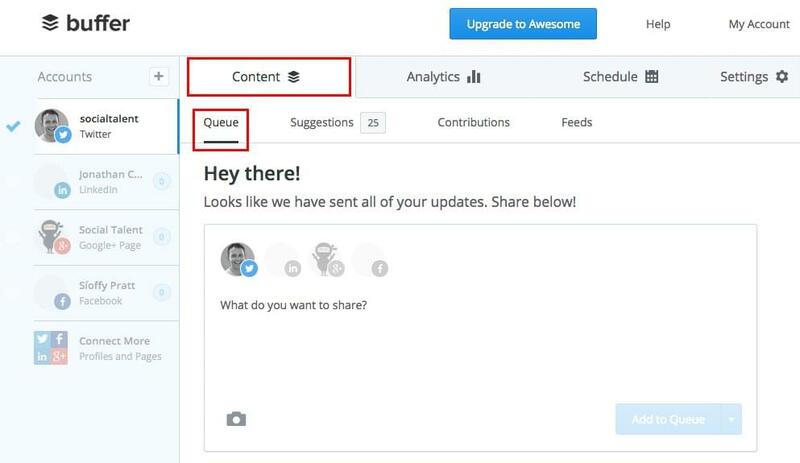 Add to Queue – click this and your update will be added to your queue of content updates to be posted according to your pre-selected posting times from Step 2 e.g. if this was my first update it will post at 7:20am, if it was my second update it’d post after the first update in the second time slot of 8:24am etc. And that’s it. You’re done! 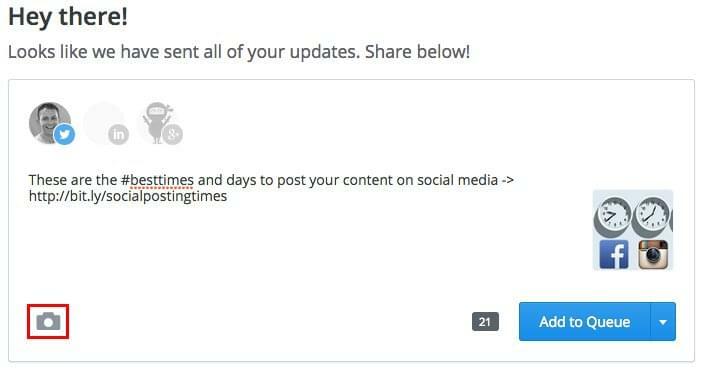 You’re content updates are now ready to post at the times you have selected. Winning! 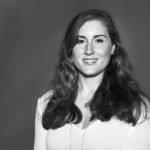 Take 10 and catch up on the 4 recruitment stories that made headlines last week, including LinkedIn's Most Socially Engaged Agencies list, the top job board in the UK and donuts...that's right. Donuts. In all the years that I have worked in recruitment, nothing got to me more than a candidate refusing a job offer. You invest so much time, effort and emotion in finding them, selling to them, courting them through the process and negotiating the offer only to have them throw you a blinder and refuse when you were so sure the deal was closed. Try performing a Premortem to recognise the rejection before it happens. In the news this week: LinkedIn re-jig both their InMail policy and their User Agreement policy, and have second thoughts about Chinese expansion, while Broadbean launch a new Search. 4 Ways To Make Corporate Job Ads Less Boring and More Buzzing! How can you write a brilliant job ad even though you work for a corporate company with 'formal' procedures!